Agents are computational systems that are capable of autonomous, reactive and proactive behaviour, and are also able to interact with each other. The application of agents in e-Commerce is one of the fastest-growing and most exciting areas of computer science. This emerging technology is enabling individuals and businesses to take advantage of the new and powerful medium of the World Wide Web. Agent Technology for e-Commerce introduces the main theory behind and the applications of agent technology in e-Commerce in a way that is accessible to students with a basic background in computer science. Bringing together economics, game theory and multi-agent systems in a clear and accessible way, this book offers an introduction to agent technology and architectures, as well as providing more in-depth coverage of subjects such as negotiation, auctions, bargaining, voting protocols and coalition formation. Mobile agents and issues of trust and security are also addressed. Containing exercises and topics for discussion, this book is ideal for classroom use or self-study, and will be of considerable interest to computing and IT professionals who wish explore the fast-moving discipline of agent technology for e-Commerce. 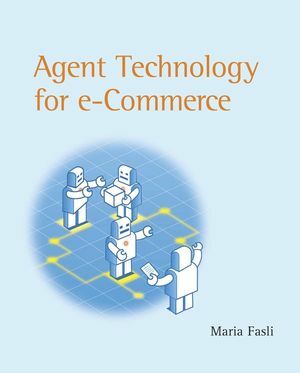 Maria Fasli has taught a course on Agent Technology in E-commerce since 2000 as part of the MSc. in E-commerce Technology degree offered at the Department of Computer Science of the University of Essex. At the time of curriculum design, this was the first such specialized course designed in the UK. This course is now being offered as an option to other degree schemes in the Computer Science Department including the Doctoral program of the Centre of Computational Finance and Economic Agents (CCFEA). A unique introduction into the theory behind, and the applications of, agent technology in e-commerce; incorporating basic elements of economics and game theory. It provides an introduction to agents, architectures and multi-agent systems as well as agent interactions including communication and cooperation. Helps computer science students to comprehend some basic principles in economics and game theory. In depth coverage of negotiation, including general principles, auctions, voting protocols, coalition formation and bargaining. Coverage of middle agents and recommender technologies as well as the technology of mobile agents and how they can be deployed in e-commerce, and of trust and security in the area of agents and in particular in the context of electronic markets. Provides a bridge between two disciplines and shows how Economics and Multi-agent systems can come together.